It’s 730AM. I just saw Darco fly out to El Salvador. Since she left I’ve embraced “hipster mode” in the city. I’m drinking cold brewed coffee at a local coffee shop, next to a man with a “man bun”. This is in the area of downtown that has old, eclectic buildings that are being turned into lofts, microbreweries, and coffee shops. 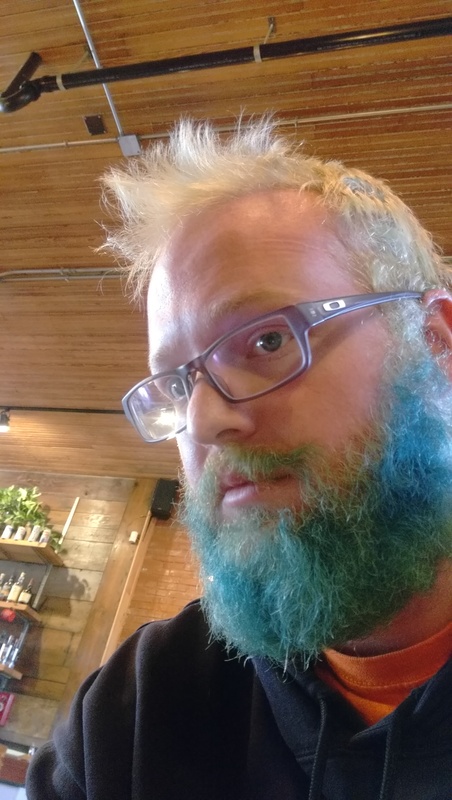 My beard game is strong with the turquoise color, and I’m even wearing my thick framed glasses. Did I mention that I’m heading to Trader Joe’s next? This is exactly why my wife doesn’t leave me to my own devices. This entry was posted in Daily Events, Humor, Reality and tagged coffee, hipster, humor. Bookmark the permalink.